THE shock of winning Saturday's Gold Lotto division one caused the Gladstone woman to drop her phone after hearing she was $443,000 richer. The winner who understandably wanted to remain anonymous had bought the winning ticket at Clinton Park News. The almost half-a-million winner spoke excitedly to a Golden Casket official about her win. "I was about to go out and pay some bills and I thought I better check my Gold Lotto ticket,” the anonymous winner said. The regular Gold Lotto player said she had been marking her entries with 'special numbers' for many years. 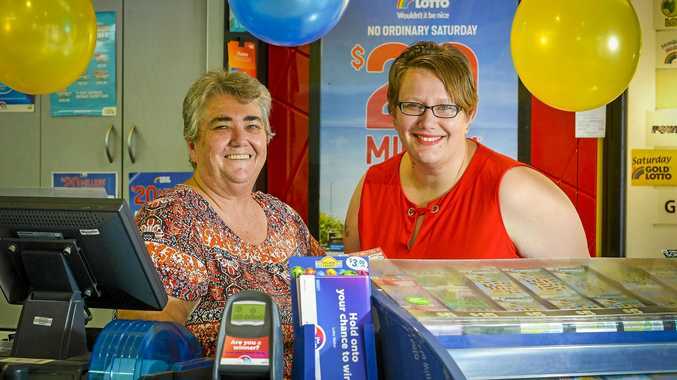 News agency employee Nola Last was thrilled for the lotto winner. "I'm just happy for her that she's got it and won the money because she's a lovely person,” Ms Last said. The chance of choosing all six winning numbers for division one with a single game is one in 8,145,000. This is the second time Lady Luck has smiled on the Ballantine St news agency with a division one winner several years ago. The previous winner was a NRG syndicate that won $1,108,604 in November 2015.